Aussie ladies may have recently noticed large tubs of NYC polishes in their local Woolworths. After seeing the colours I instantly new they were exact dupes of the Ulta3 polishes, but with different names and labels. They are both distributed by the Heat Group. One evening after work, I decided to do something totally mindless and match up the NYC colors to their dupe in the Ulta3 range. Not every Ulta3 colour is an NYC, clearly as there are more Ulta3 colours than NYCs. For polishes I didn't see in person, I used the list of NYC polishes on the Crush Cosmetics site. I know I may not have got them all matched perfectly, especially all the shades of pinks and magenta's, but I think this is pretty close. If you know of any errors, please let me know. Now after that very long and boring list of polishes, I thought I should do a quick nail picture to make the post more interesting. Although I'm sure that long and boring list will become a useful resource over time. Here is a comparison picture of the four yellows in the Ulta3 range. 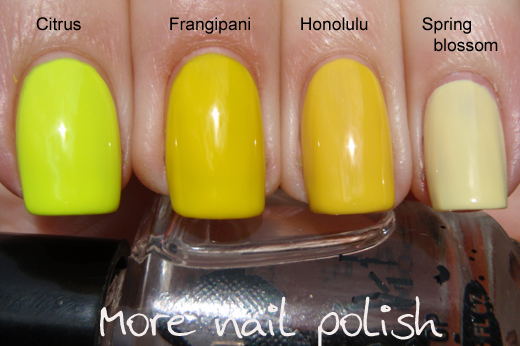 The two middle ones, the new release Frangipani and Honolulu are very similar, but Frangipani is a smidgen brighter . Doesn't Citrus look amazing here! I would only the Honolulu because I actually live in Honolulu :P Lol! All for the name. Yay a list! :D You rock!!! Thank you for this comparison!! Do you know if this is the same NYC brand in the U.S.? alexandrarc - I don't think so. I was gifted a US NYC polish, Purple Pizzazz #133, and it doesn't match any of the Aussie NYC or Ulta3 bottles in colour. The US ones are made in USA, whereas Ulta3 and Aussie NYC are made in China, the bottle labels are also totally different. There are also ~80 shades of the Aussie one, but only 15 of the US one. That would have been great though! Interesting that they have the same brand name though!